There's a commercial running on television right now for a face cream that promises to be fast-acting, and therefore won't be added to "your wrinkle cream graveyard." Every time I see this commercial, I think, "wow, I'm so glad I no longer keep products that I don't use." The main part of my strategy for not wasting money on cosmetics is to buy from places that allow returns. Today, I returned two items to Sephora... I was completely in love with each one when I bought them, but after using them at home for a short time, I discovered that I actually still preferred a different brand I had used in the past. The new ones just weren't as great at home as I thought they would be from the advertising. But the big surprise for me was that the two items totaled $100 -- I certainly didn't remember having spent so much on them, so I was very pleased that returning them allowed me to break even when I bought my old brand again. $100 is a lot of money to send to a "cosmetics graveyard." The other strategy I use to save a little money on beauty products is even easier than bringing disliked items back -- I try my best to get every last drop from every bottle. (While I'm certain I'm not the only person who does this, it's so useful that it's still worth mentioning.) 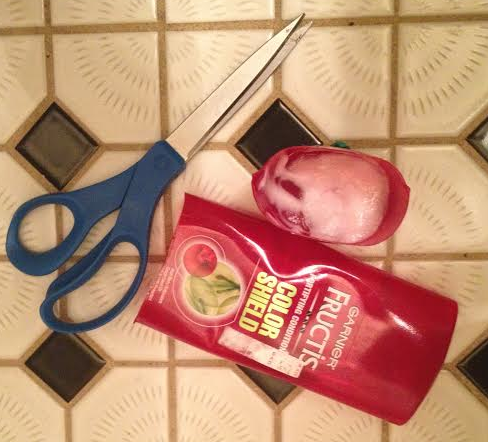 Using a pin or cutting open the bottle often results in days and days of more product to use. The conditioner in the picture above shows a great example of this -- the bottle is designed in such a way that although there was nearly a week's worth of conditioner left in there, it seemed empty when I tried to access it from the spout. By cutting it open and covering it with plastic wrap between uses, it didn't dry out, and it kept me from having to run to the store for a few extra days. This picture also highlights the real trick to being able to get to the bottom of the bottle: The type of bottle the product is in. Pump bottles are often hard to open, and I find it frustrating to know there's more product inside that I've paid for, but cannot reach. So, without making myself crazy about it, I try to purchase bottles that will allow me to get to the very bottom. If there's something I love and it's only sold in a pump bottle, say, Fresh's deliciously-scented Lotus Eye Gel, I won't deny myself the product, but if there is another option I like just as much, like Origin's GinZing, and it's in a container that allows me to use every drop, I'm more inclined to go for that one. Plus, if the container can be re-purposed later for bottling up travel size quantities of products, that's even better. The money saved in these cases isn't enough to resort to Draconian measures and only buy certain types of bottles, but if there are two options, the better bottle just might be enough to make one product seem a little bit better than the other. It's the exact opposite of falling for beautiful packaging... Falling for practicality instead.